A well-crafted record, that intrigues the listener more than is expected from typical middle of the road fare. I am finding it difficult to begin this review of Adam Haworth Stephen’s debut solo release We Live on Cliffs, so perhaps I should begin by saying, I’m not particularly moved by this record. That’s not to say that it’s a bad record. On the contrary, it’s actually a very well written, adequately produced and ably performed pop/folk/rock album. The biggest problem I’ve discovered is that from beginning to end there is little variation, and when there is, it’s almost expected, clichéd even. As a result, it is difficult to penetrate this record. It’s also difficult to discuss. How do you write about a record toward which you feel indifferent? I will try to step lightly. Stephens is one part of the duo Two Gallants, touring and creating music together since 2002. 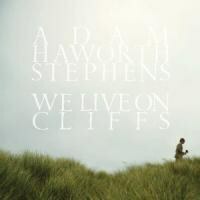 We Live on Cliffs is Stephens’ first effort on his own, and the result is a good record that is simply bland. There is nothing here that warrants more than a few listens. Simultaneously, there is nothing here to suggest you take cover. The album is a perfectly crafted MOR record. The assumption now becomes is MOR music inherently bad given its inability to strike an extreme (or even any) emotion in the listener, be it excitement or revilement? The average-ness of the record is not so suffocating that you are put to sleep. It is perfectly crafted to go unnoticed by many, but noticed just enough by those who may be listening. It’s almost as if Stephens has succeeded in elevating the MOR genre above its standard of mediocrity. The conundrum then becomes, if We Live on Cliffs is above the MOR standard, is it still middle of the road fare? The short answer is yes, with a small however. Tracks like the openers “Praises in Your Name” and “Second Mind” establish a nice folk/country/rock groove, but this soon begins to dissipate upon the realization that every other track on the album is structured in nearly the exact same way. It’s almost as if Stephens was aware of this thematic death nail and decided to cap the album at a mere 9 songs—one of a few salivations. The others being Stephens' adept songwriting abilities and the somewhat intriguing strain in his voice. We Live on Cliffs is a fine effort, but slightly more focus and drive could have given this beige record to brighter, more memorable colors.